In Harbin, the ice lanterns can be dated back to ancient times. It was said that some fishermen made rough and simple ice lanterns made of ice just for lighting. With the time passed, ice lanterns embodied their cultural features and artistic fascination gradually. Since 1960s, the Ice Lantern Art Fair has become Harbin's traditional winter activity, and it is annually held in Zhaolin Park from January to late February. As evening comes the ice lanterns in the park combine lights, lamps, sound and action in one, resplendent with a great variety of colors. The vivid and fanciful designs collect the beautiful scene in the world. 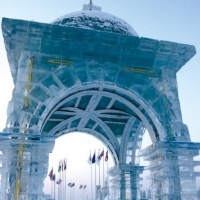 By taking the nature-endowed advantage of ice and snow, and using modern science and technology, the wise and industrious people make a number of exquisitely-carved ice and snow art work in different forms and shapes. They are praised as three-dimensional paintings solidifying notes and colorful poems. The charming scenery makes visitors immerse in fantasies and forget to return home. How to get: by electric bus routes 101, 103 and 114.